You know I read & loved "Cinder," and am waiting on library hold lists to continue the series. While waiting, Book Riot published a list of books to read after The Lunar Chronicles, and it pointed me in the direction of "The Adoration of Jenna Fox." While Jenna Fox was in an 18-month coma following a traumatic accident, her family moved from Boston to California. Jenna doesn't get to go to school anymore, and her family won't discuss her old life or her accident. Jenna has weird gaps in her memory - she has to learn less about the world around her than about herself and her own life. As Jenna begins sorting through family videos and trying to remember who she is, she pushes to go back to school and begins to uncover bits of her own life that her parents would rather she didn't know. Though she lacks the bravado of a Katniss or Cinder, Jenna is a quietly determined heroine. She doesn't want to hurt those around her, but she works to figure out who she is and what is being hidden from her. When push comes to shove, she stands up for what she believes in. Most impressive is the way in which the novel explores her thought process in developing her own beliefs and deciding what is worth fighting for. Though the premise of the book hinges on some science fiction and wades into bioethics and who decides who is human, the book's focus on relationships really shines. Jenna remembers her friends from home, but does not know why she is no longer in contact with them. She makes new friends at school and navigates the ways teenagers interact. Above all, her relationships with Lily, her grandmother, and her parents tie into the themes of the book, providing believable counterpoints on the central bioethics questions through realistic lenses. Verdict: Affirmed. A surprise read that I listened to in a just two days. I think this is going to be a book whose central questions stick with me. Audio narration is also excellent. 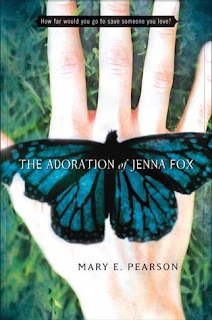 "The Adoration of Jenna Fox" by Mary E. Pearson, published April 29, 2008 by Henry Holt and Co. Audio narration by Jenna Lamia, published April 29, 2008 by Macmillan Audio.